I actually think this is a foolish sentiment, as a routine life strategy. One should not always be bolting willy-nilly through every open gate one sees. 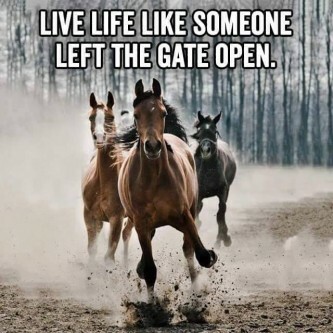 Who bolts through open gates? People who are looking for a way out. People who are some combination of bored, scared, trapped, desperate, and/or yearning for freedom. People who are convinced that what lies ahead HAS to be better than whatever they’re leaving behind. People who want to run. So here we have another category of bolter – astray, scared, and with full, after-the-fact awareness that bolting wasn’t the best idea they ever had. This was not a well-thought-out bolting, but an irrational, reckless rush into madness. When we were growing up, our family included a dog named Rusty, who would bolt at every opportunity. Gates, doors, however he could manage it, Rusty would lead us on a merry chase through the neighborhood until his inevitable recapture. That is, until the time I found him in a doorway, reached for his collar – and he snarled and snapped at me. Here I am, worried for his safety (hey, we lived at the intersection of Jamaica Avenue and Francis Lewis Blvd. in Queens! ), and this is the thanks I get for chasing him down. Fine. Be that way. And I went home in a huff, leaving him to figure it out on his own against the perils of the city. I have no idea why some dogs are bolters, and some are just plain disinterested in the open gate. He wasn’t abused or ignored or anything like that, and always had a big yard to run around in. Some dogs are calm, placidly content. Rusty was a more energetic, more interested in what lies beyond the gates, I guess. On the surface, the placid pooch seems smarter, more dignified, more mature, steadier and more reliable than the bolter. However, his worldview is more limited than Rusty’s. The placid pooch never gets to sniff and explore and learn quite as much as the one who wants to know what’s outside the gate. There’s got to be some happy medium between the sameness of contentment, and the terrifying plunge into the abyss.